The Sea Lamprey Petromyzon marinus is the largest of the three lamprey species found in the British Isles and reaches lengths of up to 1.2 m and weights up to 2.5 kg. 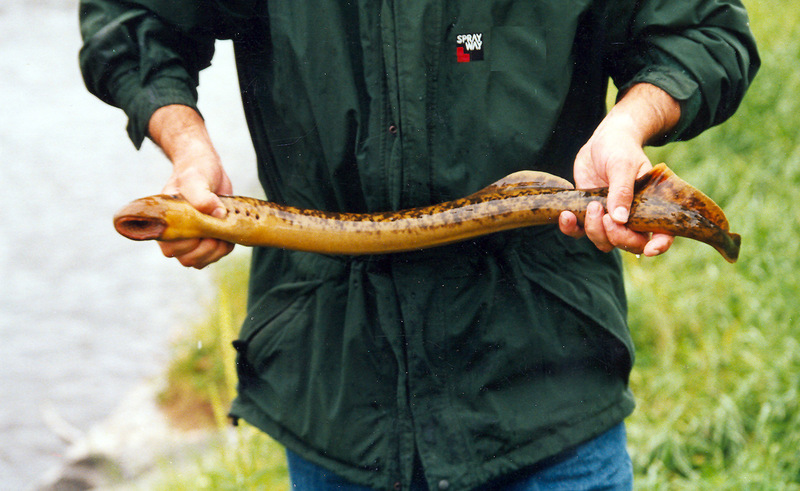 In adult form, it can easily be distinguished from the other lampreys by both its size and its sharply mottled colouration. The Sea Lamprey is widely distributed on both sides of the north Atlantic and a smaller form is landlocked in the Great lakes basin of North America. Sea lampreys have been known to undertake extensive spawning migrations, historically penetrating up to 850 km upstream on large rivers such as the Rhine and Elbe. However, there has been a marked decline over the past century in the numbers of Sea Lamprey entering European rivers. The decline is generally attributed to loss of habitat from both pollution and river engineering. 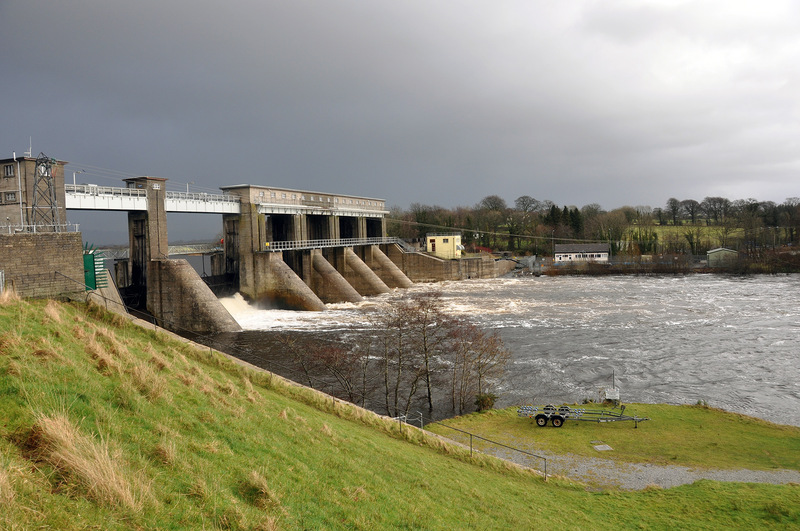 Sea lamprey enter freshwater to spawn, with spawning activity normally occurring during the months of June and July in Irish rivers. Sea lampreys generally spawn in areas of flowing shallow water among sand and gravel and pebbles of varying sizes (1-5 cm diameter). In addition to gravels and pebbles, Sea Lamprey will use other materials to construct the nest (or redd) including rubble, clam shells and lumps of clay. Spawning has also been observed at depths of 40-60 cm in currents speeds of 1-2 m3 sec-1. The nests are usually found in unshaded sites where they receive direct sunlight, often at the top of riffles or rapids where the water flow becomes calmer. In many places, the spawning sites are located below obstructions such as weirs. Sea Lampreys are often seen spawning in areas also used for spawning by salmon, trout and other lampreys. An adult female sea lamprey can produce 200,000 ova, which are deposited in gravel nests excavated in suitable areas. Ova to larvae survival rates may be as low as 1% due to poor retention in the nests, low fertilization rates and predation. 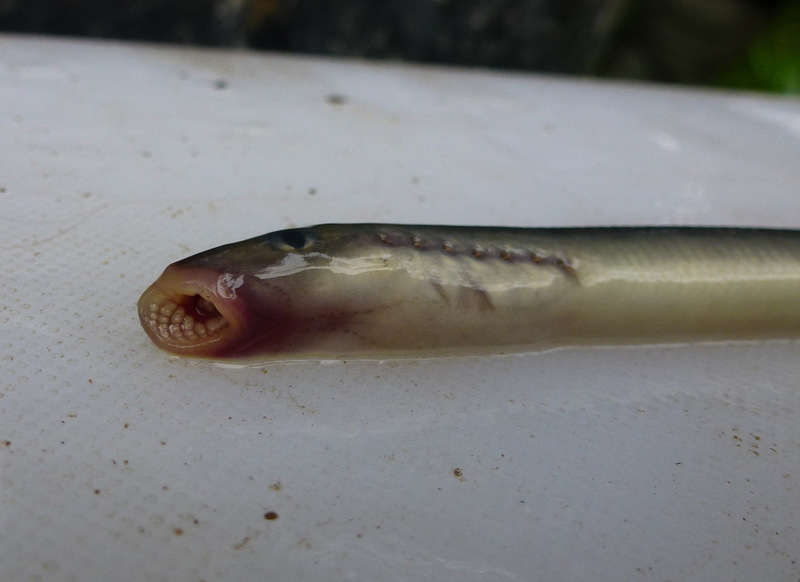 Sea lamprey ova will hatch in approximately 11 days when the water temperature is at least 15°C, but the larvae do not leave the nest for 3-4 weeks after fertilization of ova. The larvae (ammocoetes) emerge from the nests and are carried downstream in the current where they settle in silt, gravel or clay beds in shaded areas downstream of the spawning areas. The particle size in areas that they settle is in the range of 200-400 microns, and they are normally found where stream gradients are in the range of 1.6-5.7 m/km. Within the stretches of suitable gradient, adequate sites are usually found in conditions of slowing current, where deposition of sand and silt occurs (e.g. eddies and backwaters). The larval part of the lifecycle lasts for at least five years. Metamorphosis of the larvae into sexually mature, non-feeding transformers (macrophthalmia) generally occurs between July and September and usually takes a few weeks. The timing of the downstream migration of transformers (macrophthalmia) to the sea varies from autumn – spring and is dependent on the occurrence of suitable environmental stimuli. Lamprey larvae settle in depositing silt substrates in slow flows, often at the margins of channels and are active filter-feeders, feeding on detritus, algae and diatoms. After metamorphosis and the downstream migration to the sea, the adults feed on fish there, but detailed evidence on their feeding habits is fragmentary.